Beyond the luxury and adventure of Dubbo’s impressive Zoofari, this thriving regional city’s local food, history and culture mean there is plenty to entertain. 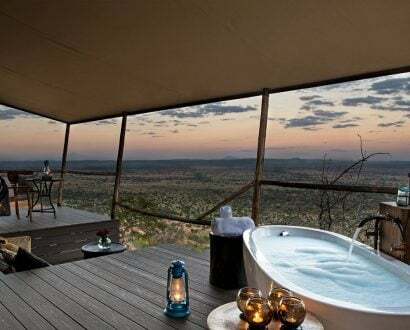 Rubbing my eyes, I peer from my four-poster bed and out the balcony doors to see the silhouette of a giraffe slowly loping past, back-lit by the pink-and-orange sky. I sit up in excitement, then quickly dive back under the warm covers; it’s a perfectly fine vantage point to watch the lanky African creatures tucking into their breakfast. A few ostriches also wander past and in the distance herds of graceful blackbuck and deer-like eland roam about. It’s not every day you get to watch such spectacular creatures from the comfort of your bedroom in a luxe safari tent as you get ready for the day — especially not when you’re in Australia, far from the animal-rich savannahs of Africa that these animals usually inhabit. Sending a photo to a friend I’d seen only days before, the reply I get is one of confusion, ‘What?! Where ARE you?’. ‘I’m on Zoofari!’ I tell her. 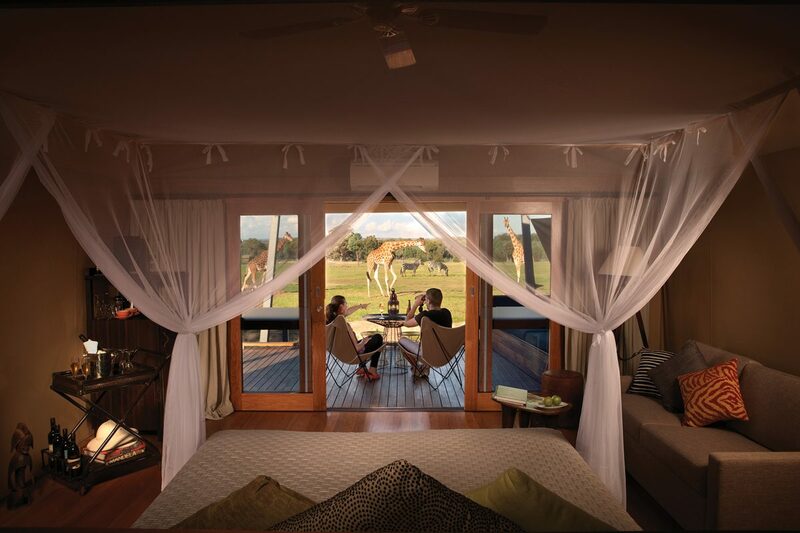 The Zoofari Lodge is the luxurious way to experience Dubbo’s Taronga Western Plains Zoo and I’m thoroughly enjoying every minute of it. Accommodation at Zoofari Lodge consists of fifteen impressively sumptuous African-styled ‘tents’, each with their own animal name, like wild dog, zebra, rhino, and meerkat. 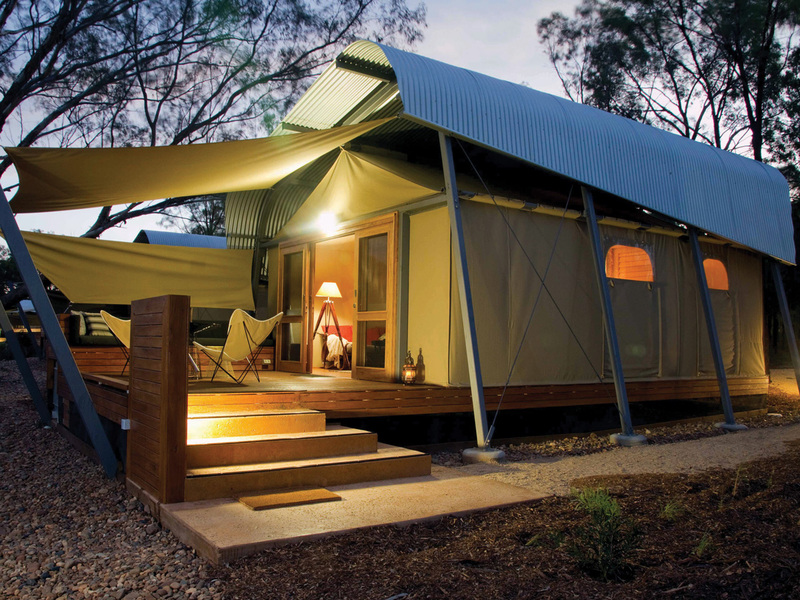 The safari tents feel secluded, backed by the bush and with a deck that overlooks the ‘African Savannah’. A moat cleverly hides the fencing throughout most of the zoo, so the animals seem as though they’re in the wild. An African-style safari tent at Zoofari Lodge. 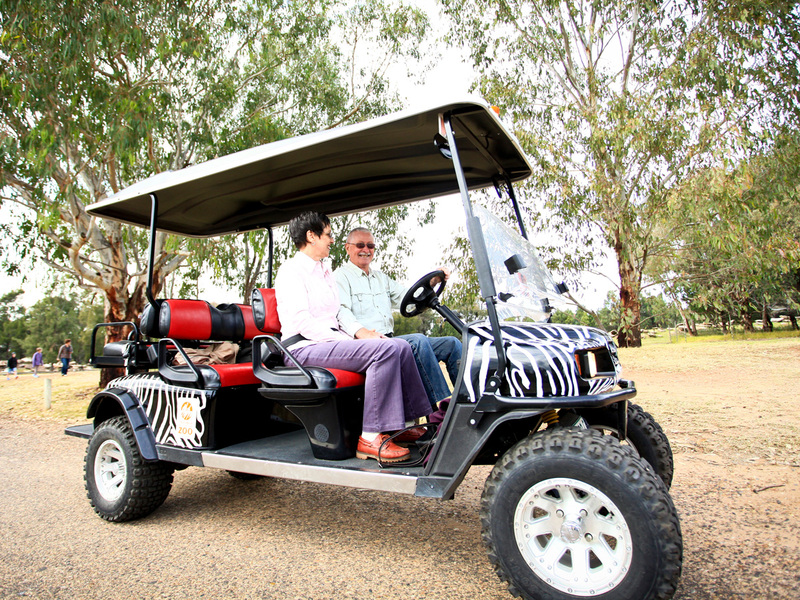 Visitors to Taronga Western Plains Zoo have the option to cruise the circuit in an electric safari cart. 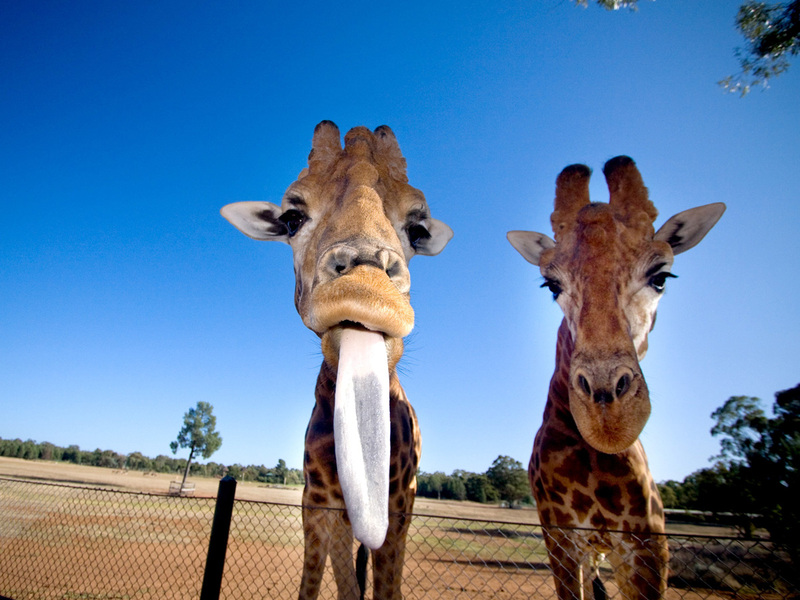 Feeding giraffes is a highlight; Dubbo’s Taronga Western Plains Zoo is home to an African elephant as well as Asian elephants. Corporate Deluxe Suite at the Quality Inn Dubbo International. 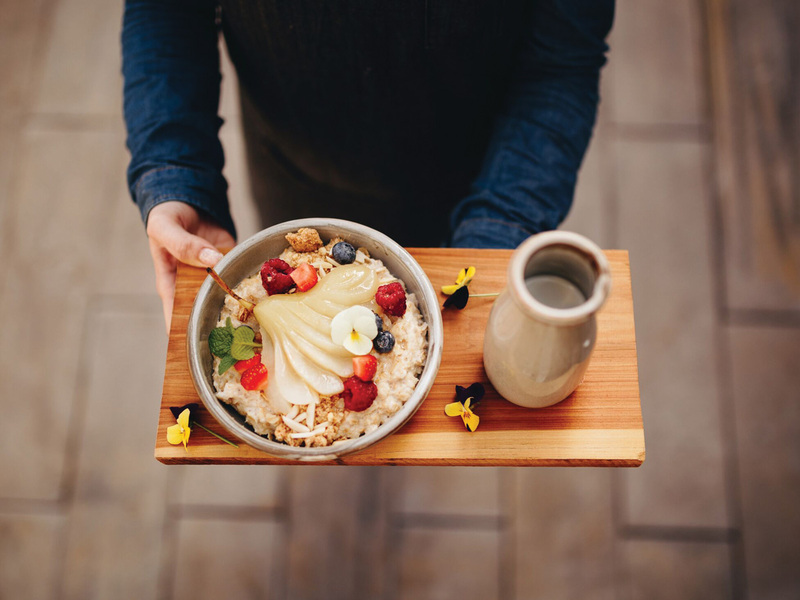 The delicious porridge at talked-about café, Press. Relax by the fire in the comfortable Zoofari Guest House. The tents are on solid raised platforms with a canvas ceiling and walls cloaking a beautiful bedroom and spacious ensuite, complete with double basin and freestanding double bathtub. Stylish timber pendant lighting, a vintage-looking timber drinks cart, mosquito netting draped beautifully above the bed, a pair of binoculars, and polished tree stumps for bedside tables all set the scene. There is more to the Zoofari experience, however, than tastefully decorated lodgings with savannah views. After check-in guests are invited to step aboard a zebra-print mini bus for an exclusive afternoon tour of the zoo. 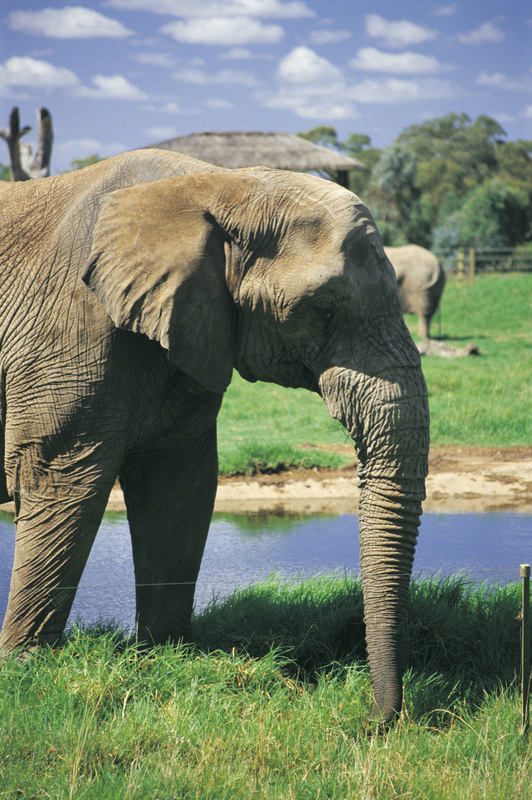 Keeping with the safari theme, the tour stops by the enclosures of African animals. These visits are timed to fit in with animal feeding times or treats dispensed by tour guide and ex-zookeeper, Steve. So you’re guaranteed to see the animals while they’re active. We stop to see the beautifully-patterned African wild dogs devour a kangaroo carcass — in about ten minutes — and we learn about their pack-hunting nature. We have front-and-centre views of the excited frenzy and unusual high-pitched yelping as they feed and share. We also meet the only African elephant in the whole of Australasia, Cuddles, and a family of hippos get a snack of lettuce, one of which is also named Cuddles. Steve points out that zoo animals don’t get cute names like this anymore, instead being given more meaningful names that relate to their place of heritage, like the lion named Asali, which is Swahili for ‘honey’. With its wide open plains and abundance of space, the zoo has many hoof and grazing animals, Steve points out, but will soon focus more on the big cats with a new lion pride experience set to open at the end of 2017. We also meet the only African elephant in the whole of Australasia, Cuddles, and a family of hippos get a snack of lettuce, one of which is also named Cuddles. take part in battling the $19 billion illegal wildlife trade. Back at Zoofari Lodge after our tour, there is time to relax on my deck’s built-in daybed, warm up with an indulgent hot chocolate and soak in the tub before heading up the bushy path to the Guest House for a pre-dinner wine tasting. 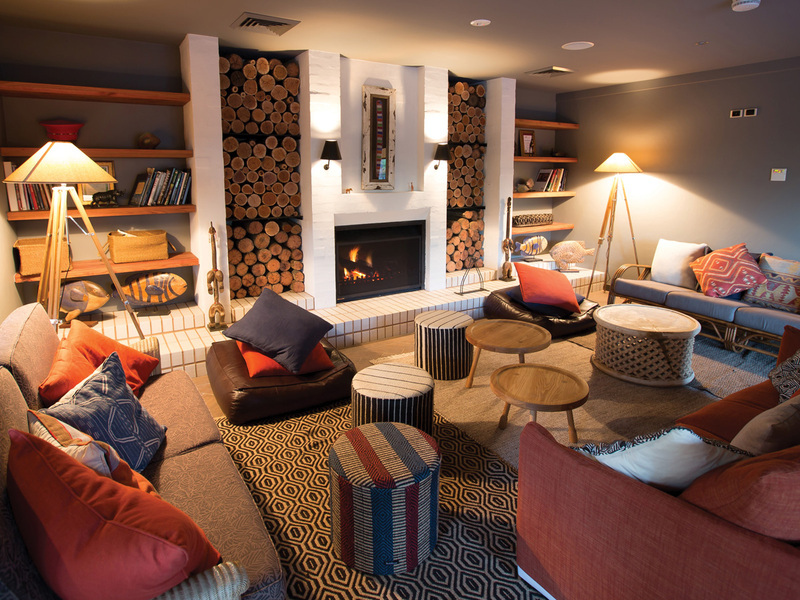 The restaurant area, bar, and lounge space is tuned in to the safari vibe and as the open fireplace crackles, we toast the evening with wine from local producers of the Central West region, including the likes of Orange winemaker Philip Shaw. Seated at long dinner tables among new friends we tuck into an impressive African banquet. Among the abundance of food is a camel stew with couscous, fruity African-style roast chicken and Moroccan lamb with quinoa. It’s not every day you get to watch such spectacular creatures from the comfort of your bedroom in a luxe safari tent as you get ready for the day — especially not when you’re in Australia. Up at dawn the next morning there is a 7am behind-the-scenes zoo tour. Before breakfast we spend about an hour-and-a-half immersing ourselves in the morning routines of some of the rare and endangered animals. The giraffes I’d watched from my balcony earlier are now stretching over a fence as we feed them carrots, their long purple tongues curling around the food. There’s time to hear the plight of the stripey bongo and the endangered white rhino and we also stop by the lemur exhibit, where Steve carefully launches banana pieces to the cute black-and-white creatures (that are actually monkeys). The huge, heated shed that houses the zoo’s elderly elephants overnight is a real highlight. Not accessible to the everyday zoo visitor, we are fortunate to see two loving zookeepers go about their morning routines with the cheeky, enormous animals. There’s their daily wash and painting to see; using her trunk, Gigi — a retired Stardust Circus elephant — is guided by the elephant-keeper to paint a canvas artwork as a way to distract her while the zookeepers give her foot a treatment soak. 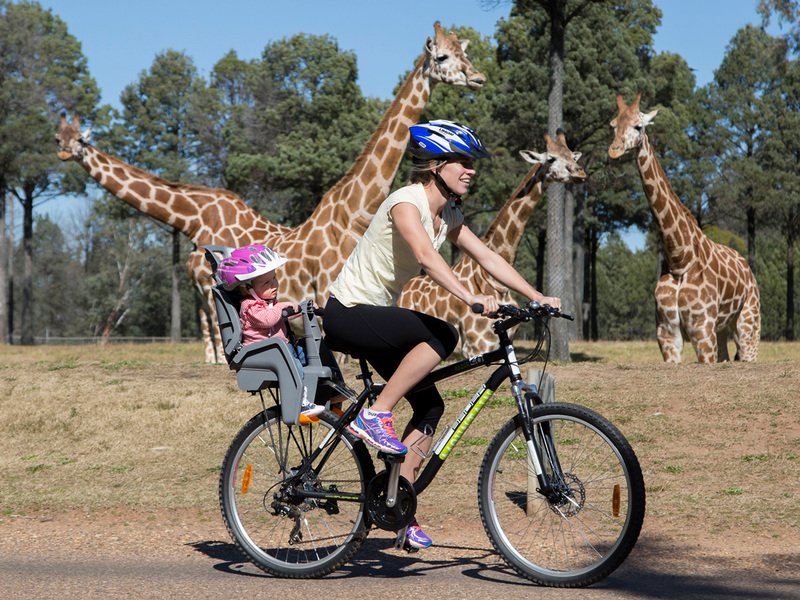 Dubbo’s size, infrastructure and position make it a busy regional outpost with all the conveniences of a major city. 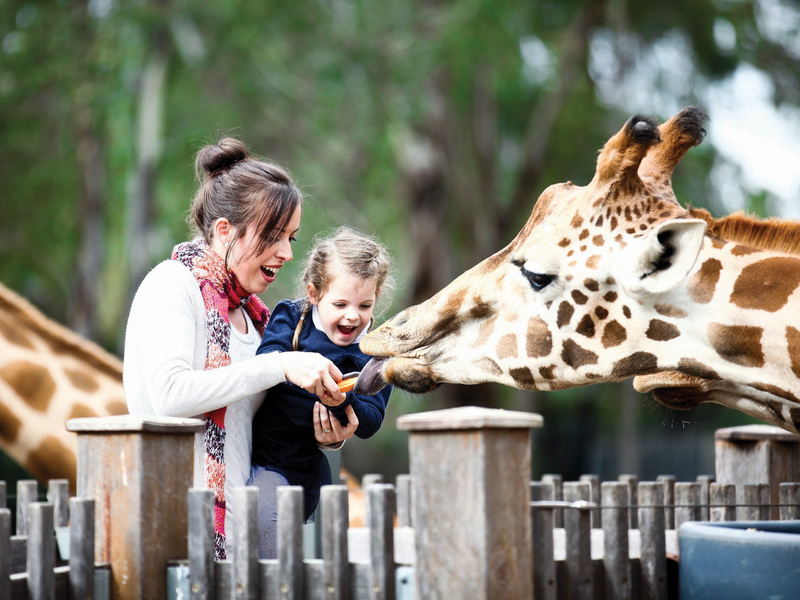 Most visitors are there on business, while holidaymakers are lured to the famous Taronga Western Plains Zoo. 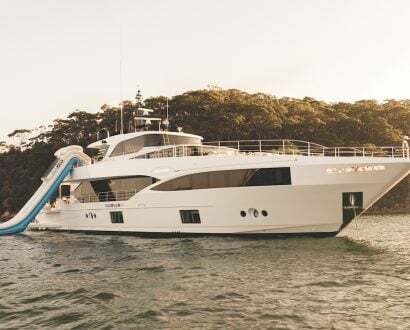 It is a big drawcard, however beyond that the city is thriving, with more than 4,000 hotel beds, new infrastructure, residential developments, and a growing retail precinct. Keen to see the rest of the town, after checking out of Zoofari I stop in at the Dubbo Farmers’ Market, near the Information Centre in the Macquarie Lions Park. Held twice a month, the markets attract people from near and far to peruse the sixty-or-so stalls. There are many farmers from Dubbo as well as Mudgee, Orange, and further afield. There’s fresh bread, native dried flowers and fruit trees, cheese from a local goat farm, milk, honey, sauces and jams, fruits and vegetables as well as local farmers and plenty of other producers. My love for chocolate draws me to Spencer Cocoa’s stall: chocolates handmade in Mudgee, using cacao sourced from Vanuatu. I also meet Linda of Linda’s Chilli Relish, who is serving tasters and she even shares her secret ingredient with me, and I stop by the honey stall for a good yarn about their industry and the importance of bees to farming. As always, the farmers’ market is a chance to chat to local growers and get a feel for an area, and I must admit that I find the people in Dubbo to be extra friendly folk. The wide streets of Dubbo are lined with shops and there are more than a few pubs, cafes and restaurants, which give it a cosmopolitan air. Buzzing corner spot Church Street Café and Bar (CSC) is the talk of the town and I’m a little surprised that you need a reservation — this is not the quiet regional city I’d been expecting. It’s modern, and the food is delicious. Another hot spot is Press, which has taken up residence at the former site of The Land newspaper, hence the name. The heritage home of Press has been beautifully furnished and renovated to blend the old with the new. With a sunny front patio and big bunches of flowers placed on countertops and tables throughout, it’s trendy and chic with a great atmosphere. The café has a strong focus on good coffee, attributed to the owners’ first venture as boutique coffee roasters. The food is to be applauded, too, with innovative, tasty dishes made from local ingredients. 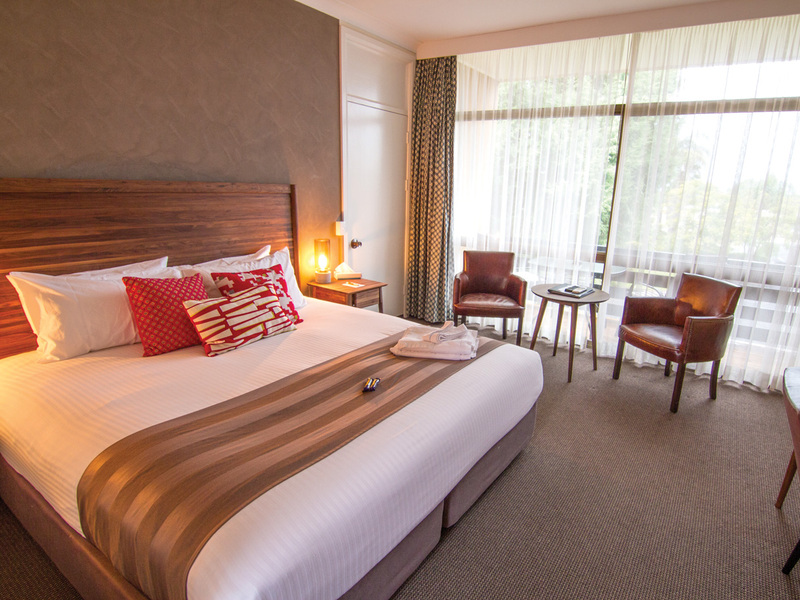 With still plenty to see in Dubbo, I check in to the Quality Inn Dubbo International’s newly refurbished Corporate Deluxe Suite. The new rooms have transformed family suites into sophisticated bedrooms complete with separate study and swish ensuites. It’s perfect for the corporate travellers that frequent the motel, though with a swimming pool and some remaining family rooms, it’s also a suitable option for those with little ones in tow. The motel’s Reflections Restaurant and Bar is a sophisticated space with a top London-trained chef drawing in locals seeking a fine-dining experience. 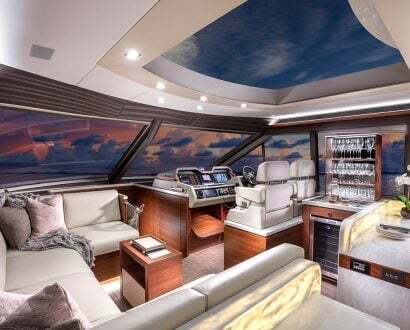 It also hosts cocktail classes and I decide to join in on the evening class. It’s fun and hands on, with about eight of us shaking, pouring and learning how to master the perfect cocktail while we share nibbles. Immerse yourself in spooky history on the Beyond the Grave tour at the Old Dubbo Gaol. As we move around the historical gaol by torchlight we learn the fascinating stories from the inmates who were imprisoned there around 150 years ago. After whipping up the Reflections Bar’s special cocktail, plus a whisky sour, and an espresso martini, I’ve suddenly got the courage to participate in the Beyond the Grave night tour at the Old Dubbo Gaol. On this creepy, adults-only tour we are given electro-magnetic field (EMF) readers so we can be alerted to the presence of spirits and try to communicate with them. As we move around the historical gaol by torchlight we learn the fascinating stories from the inmates who were imprisoned there around 150 years ago. It’s truly frightening, but also captivating and thrilling. There is plenty of action on the EMF readers and a ghost with a sad tale by the name of Maryanne seems to take a liking to me. Guides Nick and Jessica are fantastic and the night tour is a great way to engage in the history of the site. 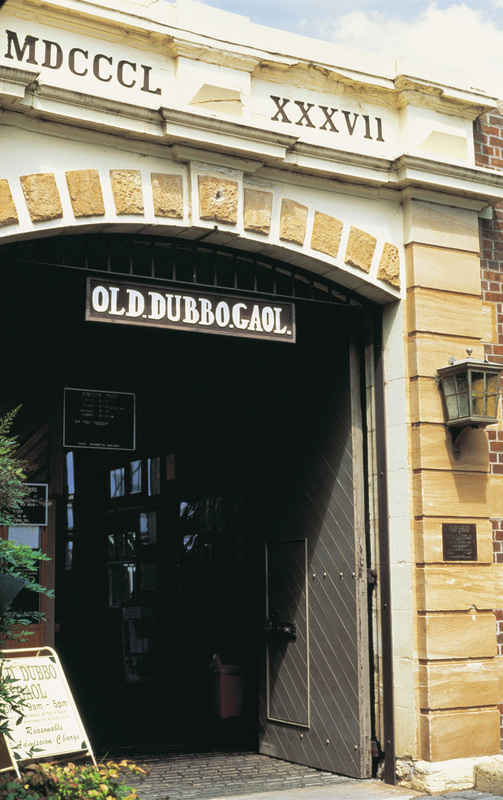 Ghost tours aside, Dubbo has a rich historical past, the remnants of which are evident not only in sites like the Old Dubbo Gaol, but also in its heritage pubs and its wide streets that were designed to accommodate the horse-pulled buggies of bygone days. The Western Plains Cultural Centre houses the former collections of the Dubbo Museum and the Dubbo Regional Gallery. The museum’s People, Places, Possessions pieces are ideal for a close look at the region’s history; there’s a well-preserved heritage classroom set up and the former school hall is filled with 5,000 personal items and tools from a range of professions, such as the old local seamstress, barber and farmers. Adjoining the museum and gallery space is a lively eatery, Outlook Café and the regional gallery has four exhibition spaces that host national, emerging, local and regional exhibitions in state-of-the-art facilities. There are also conference rooms for hire and community spaces, such as the black box theatre for drama performances and film screenings and events. The centre’s building itself is a modern structure that converges with a former school site — it’s a fitting representation of this regional city that successfully blends the modern with the historic. Jetgo has recently introduced flights to Dubbo from Newcastle. Rex, Pelican and QantasLink also offer flights to Dubbo. The city is about five hours’ drive from Sydney and about four-and-a-half hours’ drive from Canberra.